Mar 2001 – Ski reporter Rolandos Constantinides. What follows is an account of a short skiing trip to Lebanon, a country well known for its troubles, but little known for its amazing skiing. For someone like myself, living on Cyprus only 100 miles away, the trip was a revelation of all sorts. This revelation I would like to pass to you, and hence the complete account of the trip – not only of the skiing, but of the various feelings and impressions I received during my stay in Lebanon. Lebanon is only a stone’s throw away from my home, a mere 100 miles across the Med. It should therefore come as no surprise that, throughout my life, stories from my neighboring country have been featured daily in the news: War, fighting, killing, and despair. Waves of people trying to escape the massacre, arriving via boats of all shapes and sizes on our eastern coasts, were a regular phenomenon. Hardly the place to consider for skiing, let alone go. Then suddenly the war ceased. Beirut was no longer the battle capital of the world. It now became a city trying to find its lost identity, in a nation still dizzy from years and years of bloodshed. As time went on, it became possible to start thinking about what was a short while ago unthinkable: a trip to Lebanon, to explore its post-war awakening, and who knows, maybe a trip to its mountains. Lebanon is well known for its wonderful sweets, maybe the sweets extend to include a skiing run or two. The itch to go became suddenly much, much stronger, when my friend and skiing mentor, Jay Silveira forwarded to me a 1996 Powder Magazine article entitled, “The Ashes of Lebanon.” I now knew it was only a matter of time. Les Anthony’s exotic experiences seemed to prove me right – we get snow here on Cyprus, enough to operate a ski resort at 6000 feet, but in Lebanon the mountains reach 10,000 feet – and they receive the very same storms. Translation: snow, and lots of it. I started to stare eastward, with a fresh air of expectation. My only problem: after everything they had seen and experienced, none of my friends were willing to trek with me to the Promised Land of snow. The decision was made: I had to go alone. Things started to happen early last year. Through my employment I ended up with a free round-trip ticket, Larnaca-Beirut-Larnaca, that had to be used though before January 31. I booked myself for the weekend of the 29th through the 31st of January, which would give me a full day’s skiing in Lebanon (unfortunately, due to work commitments I was unable to stay longer). Using that magical tool known as “Internet” I soon discovered a very promising website: www.SKILEB.com. Within days I was in contact with webmaster Ronald Sayegh, who made absolutely sure that I was updated in all respects of Lebanese skiing. With his help I decided to go to Mzaar (ex Faraya), the biggest and most developed of Lebanon’s resorts. One of my friends having often been to Lebanon for skiing herself, and having organized skiing trips to Mzaar many times before, she insisted that after I went, I would want to go again the next weekend. I must admit I shook my head in slight disbelief. I can now gladly say that she was right and I was wrong. Time passed quickly. The Zero Day was coming up quickly, but suddenly disaster struck: I started getting the flu. By Friday, January 29, I was in very bad shape. My girlfriend drove me to the airport Friday afternoon “I am very worried – are you sure you can go in your condition? It would be better to stay – there will be another chance,” she kept saying. I replied, “I am going. I am going even if I have just to see the mountains from a hotel window.” I’m not sure if it was the flu’s fever, or snow fever that spoke on my behalf. I soon found myself boarding the Middle East Airlines Airbus A321 bound for Beirut. I was the only one with skis among 170 passengers, and my job as an air traffic controller meant that I could get the jump seat in the cockpit. About 15 minutes into the 25-minute flight, I could easily see the haze hiding the Lebanese coast. While descending into Beirut, however, I could see mountains above the haze layer. Big, roundish mountains, clearly defined, that glistened in various shades of pure white. “What are these mountains?” I asked Captain Gaby. “Faraya – the place you will ski tomorrow,” he replied. I immediately knew that going on the trip was the correct decision. Beirut Airport was certainly a symbol of resurrection with a brand-new terminal, new hangars, and new construction everywhere. I perceived this as a good sign about the skiing waiting for me the next day – if I survived my flu. By the time I got out of the airport it was dark. I expected that within a short time I would rest in my hotel. No way! The hotel driver picking me up from the airport advised of “two, maybe three hours to the hotel.” I started wondering – wasn’t Faraya only 30 miles from Beirut? The less said about Lebanese driving, both in Beirut and on the mountain roads, the better. I fully appreciated Ronald’s advice not to rent a car. Two and a half-hours later we arrived at Ouyoune-El Simane, the small village at Faraya’s base. I would stay at Auberge Suisse, a small but very cozy hotel. I could see lots of snow, but my condition was terrible. I felt more dead than alive. I had high fever, I was sweating, and I was trembling like a fish on a hook. Mr. Berge, the very friendly hotel manager, helped me out of the car and told me to go to bed, sleep a bit, and afterwards to go downstairs for an herbal tea that would “bring life back to me.” I followed his advice and went straight to bed. Around 10 p.m., feeling slightly better, I went downstairs. Mr. Berge kindly made me a cup of a strange-tasting (but good!) tea, and offered me some light dinner. Ronald also showed up, so after two weeks of chatting via the net we finally got to know each other in person. Both he and Mr. Berge told me exciting stories about the mountains, for which they both felt proud. I started liking Lebanon a lot. I went back to bed, and my only question was, would I be able to ski next day? I took a quick stroll in the village. The base of the lifts, at 1,850m (6,068 feet) was only a five-minute walk from the hotel. The air was fresh, and the walk rejuvenated me. I met again with Ronald at the base of the “Jabal-Dib” triple chair. We agreed that we would first take a few “reconnaissance” runs for photography, and then spend the rest of the day skiing. I had brought all of the good camera equipment with me, and it would prove very useful. Mzaar is by far Lebanon’s biggest and most developed resort, and also the most popular. The 11 lifts (including 7 chairlifts and two private ones) radiate to two major peaks: Jabal Dib (2,296m / 7,531 feet) to the north, and Mzaar (2,465m / 8,085 feet) to the south. You can enjoy a vertical drop of more than 2000 feet. A number of other peaks reaching similar altitudes seemed to surround the resort. We soon stood atop Jabal Dib and the views were amazing. I just could not believe that the mountains of Lebanon could be so extensive, tall, beautiful, and snowy. Snow depths ranged from about 2 feet at the base of the resort to 10 feet or more at places near the peaks. The treeline is only at 3,500-4,000 feet, so all of the peaks and slopes around us were dressed in a spotless white. I was really impressed. But then Ronald promised much better views from Mzaar, the region’s highest peak. I was really wondering if this could be possible. We soon found ourselves traversing from Jabal Dib to Mzaar via the “Traversee vers Nabil” and the “Couloir vers Mzaar” trails, which bought us to the bottom of the Mzaar triple. The snow underneath my Atomics was packed powder of the best quality that I had experienced in years. All around me were snowfields, varying in pitch from very steep to practically flat, covered in pristine fresh powder that fell in quantities only two days ago. Of course, the sun did work the snow a bit, and the powder off piste was getting very heavy. The temperatures were seasonable, with mid-forties at the base and mid-twenties at altitude. After a quick ride on the Mzaar triple, we found ourselves standing on top of Mzaar, the highest peak in central Lebanon. Well, I have to admit that Ronald was absolutely right. The views in all directions were stunning, simply beyond description. To the North, way in the distance, the AntiLebanon Mountains and the Cedars area named for their cover of cedar trees were raising their head. To the East, it was just row upon row of more white peaks, usually roundish, extending all the way in the distance to the Syrian border. To the South, Mount Hermon raised high its white cap, a sea of haze and clouds separating the mountain from the Bekaa Valley directly below us, which with its contours and terraces was just… indescribable. And to the West, the shimmering Mediterranean seemed to be just a jump away. Beirut was lying practically below our feet, and in the distance, above the pale blue of the sea, I could readily see the tops of thunderstorms over my island! Although pictures are said to be worth a thousand words, in the case of Mzaar, no picture can do justice to the views in all directions. I remember stupendous views from my one week at Val d’Isere, but certainly nothing remotely as striking as the view from Mzaar. With the initial excitement over, and the necessary pictures taken, we started skiing. The Mzaar trail, described on the trail map as red (similar to a single black diamond in the U.S.), offered me the steepest skiing I had experienced since my Val d’Isere trip in 1996. Thank goodness that my flu-weakened quads supported me, and within seconds I regained my rhythm, linking turns on the freshly groomed snow. The skiing was certainly worth all of the effort and the risk that I had taken by going to Lebanon in my condition. We caught a quick snack and started skiing all over the designated trails. We hoped from lift to lift, traversed from trail to trail, usually with Ron in the lead and me, continuously awestruck, closely behind. All the while I kept wondering how was it possible to have such a skiing heaven in my own backyard and not discover it before. We stayed on red trails (no trail is officially designated as black, though some approach 30 or more degrees and sustain themselves). Despite being Saturday, there were no crowds and no liftlines; we seemed to have the mountain to ourselves. Ronald explained that this was not a special privilege for my visit, it was just that for most Lebanese the upper trails at both Mzaar and Jabal Dib are simply too much of a challenge. Indeed, I was later to find out that the crowds congregated on the few blue and green trails, leaving the steeper and longer red trails for the privileged few. At some point, while riding the “Piste Rouge” lift I spied someone jumping off a huge cornice and executing a flawless landing twenty feet below in perfect style. Ronald informed me that he was the local extreme / freestyle champion. I soon realized that extreme skiers are few in Lebanon, but what few there are, they are very hot. So hot, in fact, that they caused a great increase in freestyle’s popularity. As a result, Team Elan was up for a show at Mzaar resort the following week. The limited number of extreme skiers in the area could be confirmed by their tracks in the powderfields – or rather the lack of them. Very few of those steep snowfields showed tracks – there seemed a whole world of first tracks for the demanding skier to conquer! The skiing remained awesome throughout the day. A quick stop for lunch at the base proved Ronald right regarding the crowds on the easy trails. Most skiers seemed to be sitting at the base restaurants, skiing once or twice on the easy trails, then sit some more, and then ski the flats some more. The snow started to get heavy under the strong Mediterranean sun, and by the end of the day it was turning to corn in places. But even then it was still very skiable and certainly very enjoyable. On certain trails, such as those around the “Nabil” lifts, small bumps formed, and we had a blast through them. We skied quite a bit of what Mzaar had to offer – inbounds that is. We got nowhere near skiing all the inbounds terrain, it was just plain impossible to do so in a single day – even without liftlines. As for out-of-bounds, maybe a few months of non-stop skiing could be enough. Here I have to stress that the trail map makes the terrain appear uninteresting and boring, but the actual experience was a very pleasant surprise. Even during this single day of skiing Mzaar (ex Faraya), I managed to get exposed to something completely new in skiing. In a shady, unnamed, red chute-like piste off the Nabil chair, we saw a skier rhythmically disappearing and reappearing in what appeared to be clouds of powder, yet no visible trails were left behind. We decided to explore the situation. Although the high pitch of the trail kept most skiers away, it just couldn’t be untouched, ungroomed powder. We soon discovered a new sweet treat: For reasons that probably have to do something with the microclimate situation of that trail, the snow was deep, very deep loose snow grains, each grain slightly smaller than a grain of rice, slightly larger than a grain of sugar. In a trail that looked formidable at first sight, you had to keep the skis pointed directly down the fall line just to keep yourself moving – only the slightest of turns were needed. It did feel like skiing deep powder, but in a denser white medium. Sort of skiing through rice crispies! Delightful! We had a couple more of runs in that sweet chute just to enjoy ourselves. The overall snow conditions were on either side of excellent. Deep snow, all natural, to a depth of more than ten feet at places – and this was before February and March, the snowiest months of the year. There were frequent huge drifts on the treeless slopes, and in spots there were extensive cornices. There were also the best sastrugi formations that I had ever seen anywhere. Ronald said that after a typical dump (one to two feet are “typical” and quite frequent) the off-piste skiing is simply incredible. After my single day at Mzaar I certainly believe him. The out of bounds at Mzaar extends for miles and miles in all directions, except to the west. It seems that it would take forever to explore all the powder possibilities there. Of course there is the usual avalanche danger, but avalanche-prone areas are well marked inbounds, and if common sense prevails, shouldn’t be much of a problem for sensible skiers. I must admit that I was pretty lucky, as I ended up at Faraya only two days after a storm and enjoyed brilliant sunshine. But judging from the comments I eavesdropped, what I experienced was not beyond the ordinary for this early in the year. I can only shiver at the unlimited possibilities. Yes, it was true, the sweets of Lebanon could really be found on its mountains. We kept going up and down until the time the lifts had to close. My skiing performance ranged from below standard to barely above acceptable, especially towards the end of the day as the effects of my recent flu started to show up. It was almost impossible to keep up with Ronald, who was an excellent skier and in good shape, but he was patient enough with me that day to wait whenever I was slow. Despite my exhaustion and weakness, I just didn’t want the day to end. But all good things in life usually have an end, and so did that day in Mzaar. Soon I was back in Ronald’s car, heading towards Auberge Swisse, stopping en-route at a military checkpoint – a vivid reminder that war may be over in this country, but not everybody is relaxed. I thanked Ronald for one of the best days of my entire life, checked out of the hotel, and I was soon on my way back to Beirut. With the little daylight still left I was able to see the various small towns along the way. Small settlements in patchy snow, a little bit below the ski area, wore an air of indifference to the excitement I felt skiing on their own mountains. It seemed that nobody was moving in these villages, possibly a remnant from the days of war. Children were playing while wearing military uniforms. Graffiti in all shades of green and red covered many walls, with the messages in Arabic letters incomprehensible to my eyes. “They are threat messages from one faction to the other,” my driver informed me. “Things are still tense – we never know who is a friend and who is a foe – and we Lebanese are too insignificant, we just suffer from the inexorable benefits of the great powers.” How true! I have been feeling the same for so many years with all that my country has suffered (and it still suffers, but that’s another story…). Although Beirut is renowned for its superb nightlife, I did not have the strength to enjoy it. I checked in at the Casa D’Or Hotel, in the heart of Hamra (the shopping area of Beirut), had a nice dinner of falafel and shish kebab, and went straight to bed. Upon rising the next morning, I took a stroll from the hotel to the seaside and back. Beirut seemed the capital of contrasts. I recalled Anthony’s words in his article: “Everything seemed half-finished or half-wrecked, and it was hard to decide where the destruction ended and the resurrection began”. Buildings full of bullets and holes from bombs stood side-by-side with modern towers. But the various signs and shops that sprang up all over made it clear that Beirut was again becoming a lively beehive. On cutting a corner I even discovered a “Ben & Jerry’s: Vermont’s Finest” outlet shop about to open in February. I was almost shocked – perhaps a Ben & Jerry’s outlet in Beirut was the last thing I expected to see, especially knowing that many Lebanese are still blaming Americans (and all companies associated with them) for their country’s misery. But at the same time it felt good – it was a sign that things are indeed changing, that peace is really returning to this tortured city. The seafront, lined with palm trees and with the glistening white of the Mzaar Mountains providing a beautiful contrast to the dark blue of the sky and the turquoise waters of the Mediterranean, was full of people. Nothing in their behaviour could suggest that only a few years ago, these people were fighting each other. A couple of hours later the wheels of the MEA Airbus left the tarmac of Beirut’s runway 15, taking me back to Cyprus, and bringing to an end a most memorable trip. As we climbed away, I recalled another of Anthony’s comments in his Powder article – that his skiing in Lebanon “amounted to the best he had for the whole season.” In my case, it amounted to the best skiing I had experienced in several seasons, by far the best skiing since my visit three years ago to Val d’Isere. The realization of having such a skiing heaven in my own backyard and not playing with it for so many years almost made me feel like crying. But now the treasure has been discovered. And it is more than certain that it will only bring pleasure, tons of pleasure to my future skiing! I will be returning. Many individuals helped out in my going to Lebanon for this trip: MEA offered a free trip to the Cyprus ATC Association and ended up with me. The people both at Auberge Suisse (especially the manager, Mr. Berge) and Casa D’Or were very hospitable and at all times I felt treated like a friend, not a paying customer. Captain Gaby of MEA offered tons of advise on my inbound trip, and was a great company on my outbound trip – Thanks Cpt. Gaby! Marc Guido has agreed to post my account of this excellent adventure on First Tracks!! Online – Thanks Marc! And finally, a great, GREAT THANKS goes to Ronald Sayegh of SKI LEBANON, who made everything possible for me to enjoy my Lebanon skiing from before my visit to until after I returned to Cyprus. Ronald, with his patience and support during our day of skiing, was an excellent companion on the slopes and added a whole extra dimension to this trip. THANKS Ronald! Looking forward to seeing you again this winter! Despite the years of war, Lebanon is an increasingly safe place to visit. Being a Cypriot, there were no special requirements for my entry to the country, but it is possible that for Americans, Canadians, and maybe some European citizens, certain requirements apply. MEA (the national Lebanese airline), some European airlines (including Air France, British Airways, KLM, and Swissair), and most regional airlines provide flights into Beirut International Airport. Hotels in Beirut are not too expensive with adequate service. I stayed at Casa D’Or Hotel, and was very pleased with my stay there. It was a four star hotel in the heart of the commercial center of Beirut, and with some phone calls and other extras I paid US$90 for one night. There are many cheaper hotels scattered mainly in the commercial center of Hamra, or near the Casino to the North. There are all sorts of shops in Beirut, and prices are lower than in Europe or the US. The Duty Free at Beirut Airport is the cheapest I have ever visited, certainly more than worth a visit. You can find all sorts of food, from typical fast-food (McDonald’s and the likes) to all European Cuisines and of course all the Lebanese specialties. Don’t forget to sample some of the incredible sweets for which Lebanon is so well known. Regarding the skiing, whatever I might have said above, it just could not really represent the real thing. You have to experience it to believe it. There are at least five skiing resorts in Lebanon, with Mzaar (ex Faraya-Mzaar) being the biggest and most developed, while The Cedars appears to be the second option. You can also visit Faqra, Laqlouk, and Zaarour. As for the out of bounds, it certainly defies description with unlimited possibilities. There is enough space on the slopes slopes just around Faraya to build a mega-ski area like those of the Alps or Colorado, but no such plans exist at the moment, and as Ronald pointed out to me it is unlikely that such a resort will ever be created due to legislation and problems in land ownership. Skiing is cheap, with a weekend day ticket at Mzaar costing around $28. Incidentally, another peak at Mzaar, Warde (2,438m / 7,997 feet) is currently being developed, and will hopefully open this coming season, offering another 6 lifts and of course will be connected to the other two peaks. The Mzaar resort is surrounded by many hotels, in and around Ouyoune-El Simane, which offer quite reasonable prices and commendable service. The one that I stayed at, Auberge Suisse, was certainly worth every cent – nice people, nice food, great service – highly recommended. Transportation from Beirut to Faraya and back can be a problem though – although there are taxis at Beirut airport willing to get you there, the taxi fare would cost more than the hotel bill! It might be better to arrange for transportation while making the hotel reservation. Do not even think of renting a car – driving in Lebanon seems to need quite a bit of improvement, and anybody unfamiliar with local driving customs would be in serious trouble. 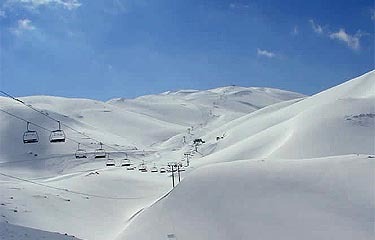 The best source of info for skiing at Lebanon is undoubtedly Ronald Sayegh’s SKI LEBANON site (www.SKILEB.com). An excellent site certainly worth visiting, with up-to-date info on ski conditions, ski area deals, activities, and all other pertinent info such as hotels, restaurants, how-to get instructions etc. Ronald, at 30, is an accomplished skier and his website more than accurately portrays his love for skiing at his county’s immense playgrounds.